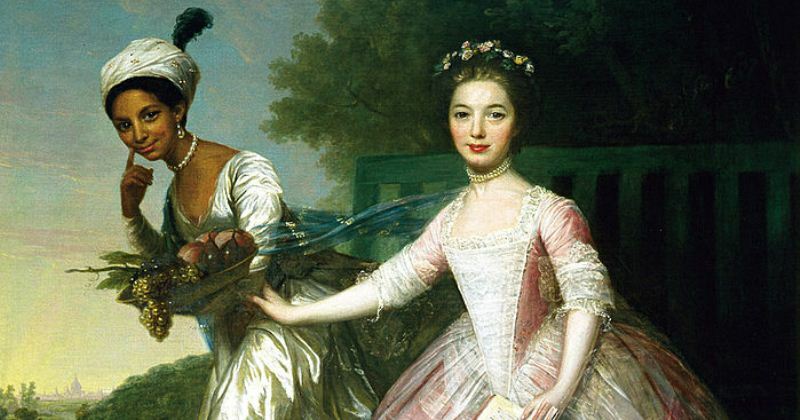 Set in around 1770s, Belle (Amma Asante, 2013) is based on the true story of Dido Elizabeth Belle, an illegitimate, mixed-race daughter of the nephew of the then Chief Justice of England, Lord Mansfield. Both by birth and color, Belle is considered inferior and beneath the social standards. Lord Mansfield takes her in when she is young and gives her a good upbringing, along with his other fair-skinned grandniece Elizabeth Murray. She is given all the required education and etiquette which befits a lady. However, in any social gathering, she is asked to stay away and is allowed to meet the ladies only after dinner in a private parlor either to play cards or piano or perhaps a long walk in the lawns. The movie picks up steam with the notorious Zong massacre which happened in 1781, where more than 100 African slaves were first insured as cargo, later diseased and thrown into the water in the pretext of shortage of water supplies. The traders file a claim to encash ‘the human cargo’ with the insurers. The insurers refuse to pay the money saying that the slaves were deliberately thrown into the water and it is against humanity to do so. The matter is brought before Lord Mansfield to pronounce the verdict. Belle, along with a lawyer Mr. John Davinier fight for the insurers, and are instrumental in convincing Lord Mansfield to rule against the traders. The verdict is known in history as a turning point, and was a stepping stone for the abolition of slavery in England, though the eradication did not happen for 50 more years. Belle is shown as a free-spirited rebellious girl, who refuses to accept her disgrace because of her color and birth. She questions everyone, including Lord Mansfield at times, especially when he falters under social pressure. Mr. Davinier is a lawyer passionate about his beliefs and works relentlessly to oppose the torture and the brutal massacre of the slaves onboard Zong. But the man who steals the show is Lord Mansfield, a man who had the power to change the destiny of England. On one side, he had to answer to his own conscience and to his grand-niece ‘Dido’, to whom his love was unconditional; and on the other, he has to defend his status in a racist society which demanded verdict to let slavery prevail. The three main protagonists have done a fabulous job. But Tom Wilkinson outshines all of them. The screenplay is excellent and the story flows from one scene to another. There are a few liberties which this film does take, there are certain scenes which are bold considering the fact that it is a period drama. Especially, the end is a tad too dramatic. The movie has a fairy tale-ish ending with Belle marrying well, and Lord Mansfield taking him as a confidante. But on the contrary, this is not the truth. In reality, Belle remained with Lord Mansfield until his death. He depended on her for all his office work and she was his confidante. In his will, he grants her freedom from slavery and also an annuity making her an heiress. After his death, she marries a Frenchman Mr. Davinier, a steward to another gentleman, who belonged to the same Parish and bears him three sons. She dies shortly at a young age of 43, just 12 years after Lord Mansfield passes away. “Let justice be done, though the heavens fall”. Anantha is an IT Professional. Writing is her passion. She writes short stories, book reviews, movie reviews, small stories for children and play scripts for the theater. She regularly conducts storytelling workshops for children.